Secrets revealed – HOW TO videos – by The Fish Vet. Fish Vetting Techniques & Practical Tips arms you with tools on the best ways to diagnose and treat any type of diseased fish. This DVD with its videos makes it the single most comprehensive resource for every fish veterinarian, fish farm manager, fish hobbyist, biology student, veterinary school, zoo and aquaria. All your questions about veterinary procedures on treating all fish types are answered in this DVD. 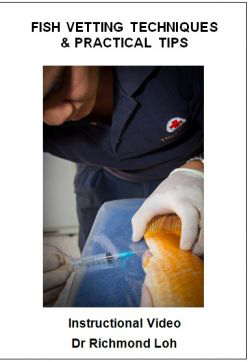 Experienced Australian aquatic veterinarian, Dr Richmond Loh, takes you on an absorbing journey into the world of fish vetting: learn how to take diagnostic samples, how to treat fish, and even how to anaesthetise fish and perform surgery! Buy a copy now – soon you will be able to see how Dr Loh treats fish with full confidence! Next Post It’s all too easy to blame carp. But what is the real cause of the degraded condition of Australia’s rivers?